Jim McCusker, Rensselaer Polytechnic Institute and 5AM Solutions, Inc.
CSHALS is the premier annual event focused on the practical application of Semantic Web and other semantic technologies to problems in the Life Sciences, including pharmaceutical industry and related areas, such as hospitals/healthcare institutions and academic research labs. CSHALS has for 7 years been the ISCB reference conference for cutting-edge practitioners of knowledge engineering and forward-thinking strategists in information and knowledge management in the life sciences. 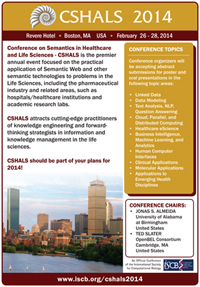 Topics covered by CSHALS 2014 span the continuum between semantic standards development, data analytics, knowledge representation, information and knowledge management, knowledge engineering, and machine learning and reasoning. CSHALS 2014 should be part of your plans for 2014! A cash prize of $250 will awarded by the International Society of Computation Biology for the most outstanding student poster. Software licences for Sentient Knowledge Explorer PRO will be awarded by conference sponsors IO Informatics to authors of the most outstanding paper. Research papers: up to 12 pages that report on original research, and / or novel methodology that have led to significant outcomes with potential for lasting impact. Papers should demonstrate theoretical soundness of the research and/or strong evaluation. Application papers: up to 6 pages that report on original research with successful application demonstrated by an improvement over existing methods. Papers may include systems level approaches using established methodology in a novel application domain. Presentation Abstracts: Abstracts of upto 500 words reporting on ongoing projects that have met key project milestones but are not ready for fully documented disclosure. Submissions may also describe funded research proposals. Posters: Abstracts of 500 words reporting on early research results focusing on the design and application of semantic technologies in life science scenarios. Priority will be given to submissions offering a functional demo that can be shown at the conference. Papers are to be prepared using Springer's LNCS templates and submitted via EasyChair. Please note: CSHALS conference registration for accepted presenters must be completed by January 31, 2014 remain eligible to present at CSHALS. Payment of the conference registration fee is the responsibility of the presenter. Linked Data - generation, representation, and management of data using the W3C’s Resource Description Framework (RDF) and Linked Data principles. Data Modeling - Ontologies, Taxonomies - practical application of knowledge engineering principles and techniques to data modeling. Text Analysis, NLP, Question Answering - use of semantic technologies for processing natural language. Cloud, Parallel, and Distributed Computing - use of semantic technologies for representation and management of distributed computational resources and workflows. Healthcare eScience - Translational Medicine, Pharmacogenomics, personal health records (PHR) - patient-centric use of semantic web technologies to handle the integration of clinical and biomolecular data. Business Intelligence, Machine Learning, and Analytics - semantic applications for data analysis, inference, and decision-making. Human Computer Interfaces - development of interfaces or design criteria that involve humans in the process of knowledge creation. Clinical Applications - Use of semantic web technology or architectures, including the orchestration of webApp ecosystems, as part of medical care delivery. Molecular Applications - Deployments of semantic web technology in biomolecular and biochemical domains. Applications to Emerging Health Disciplines - Use of the semantic web’s integrative and distributed nature to support emergence of novel applications in health care. 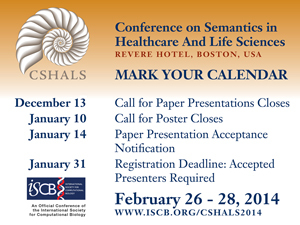 Delegates registered for CSHALS 2014 – Conference on Semantics for Healthcare and Life Sciences are able to take advantage until Friday, February 7, 2014 of the special conference rate of $149.00 plus taxes (see below). Delegates may reserve their preferred accommodations directly using the link available >>click here<<. Or by telephone with the hotel directly 1-855-673-8373 and asking for Reservations. Please identify yourself as a CSHALS delegate to qualify for the rate. Group Rate: $149.00 single / $149.00 double occupancy The group rate is for a standard guestroom type. The above rates are subject to Massachusetts Lodging tax currently at 14.45%. Please note that group rates are available for up to 3 days before or after the dates of February 26 – 28, 2014. Upgrade requests are based on availability and upgrade fees are subject to change. For more than two guests, there will be a $30.00 charge for each additional person in the room. There is no charge for children 17 years or under when sharing a room with parents. The conference guestroom rate includes complimentary in-room wireless internet. To avoid an individual guestroom cancellation charge equal to one night's room and tax, please notify the hotel of any cancellations 72 Hours prior to your scheduled arrival date. Please be sure to obtain a cancellation number at the time of cancellation and retain this number for your files. Hotel check-in time is after 3:00 p.m. and our check-out time is 12 noon. Anyone arriving earlier than 3:00 p.m. will be checked in as soon as rooms become available. On your departure date, guests may incur a late check-out fee should they check out after 12 noon. The hotel is pleased to arrange for baggage storage for attendees' luggage. EARLY DEPARTURE FEES An early departure fee of $50 plus tax will be assessed to any guest who departs earlier than the date confirmed at check-in. The fee will be automatically posted to the guest folio on or after departure. Emergency or special circumstance situations will be reviewed on a case-by-case basis. Cancellations received on or before February 1, 2014 will receive a 50% refund.